Oh yes, these are nom-licious donuts. They are baked and happen to be vegan and low fat. 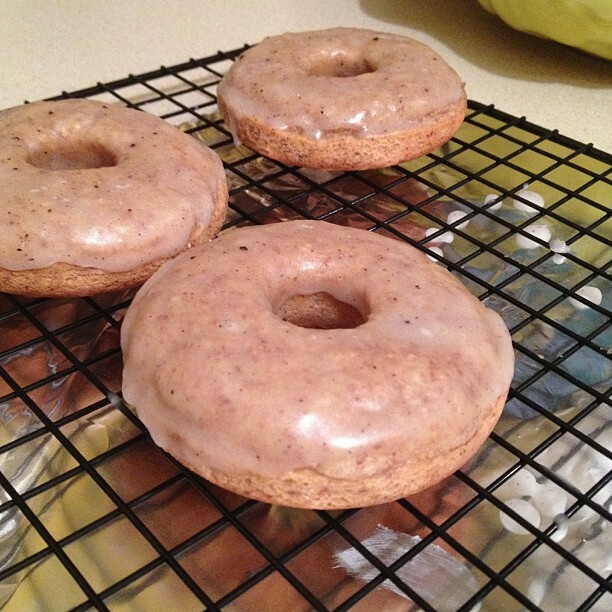 Meet spiced vegan cake donuts. I really didn’t intend for these to be a post but they were so good and a bunch of instagram peeps were excited about the recipe and excitement is catching! 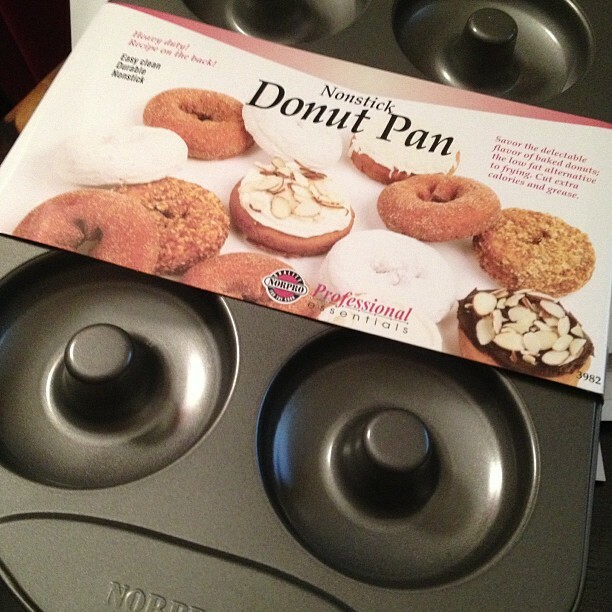 Excitement began when the new donut pan arrived. Thanks to Amazon, it was several dollars cheaper than our local kitchen supply store. Within a half hour of the pan arriving, I had it washed and heating in the oven (to season it and remove any funky taste – thank you reviews). While that was happening I was devising how I would alter the recipe. Goals were to replace the eggs and use whole wheat flour or a combo of healthier flours. I’m saving the date paste substitution in place of sugar for round 2. 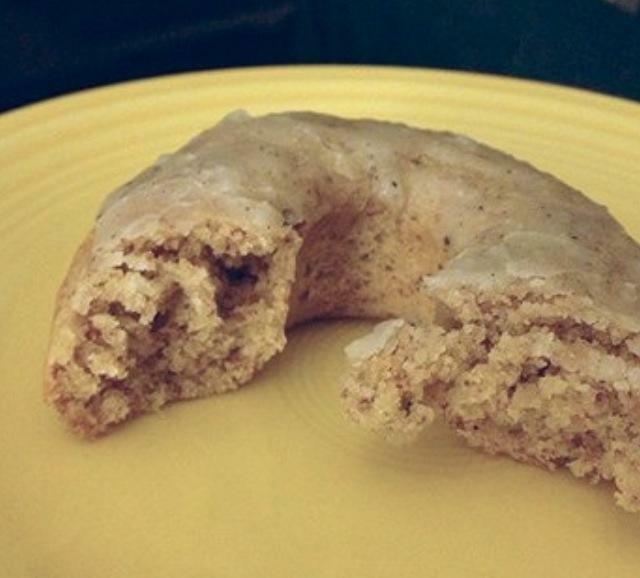 This recipe is an adaptation from the back of the Norpro donut pan. Add the flax meal and water to a small cup and stir well. Set aside in the fridge to 'gel'. Lightly grease the donut pan. In a large bowl, mix flour, almond meal/flour, cane sugar, baking powder, nutmeg, cinnamon, and salt. Stir in almond milk, flax eggs, vanilla and earth balance. Mix really well until blended (I used a wooden spoon). Fill each donut cup approximately 3/4 full. Bake 15-20 minutes (mine were not done at 10min ?) in preheated oven, until donuts spring back when touched. Allow to cool slightly before removing from pan. I tapped mine over a wire rack and they came out nicely. 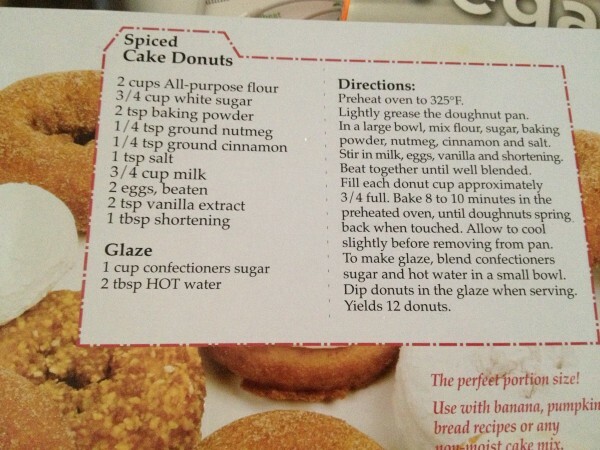 Dip donuts into glaze if using. I glazed them while warm and left them out on the wire rack for a bit before tucking them into a Tupperware container. This morning they were still delicious. I used a combo of whole wheat and almond meal because straight whole wheat can make for a dense baked good even when using pastry flour. These are light, cakey and have a great flavor.